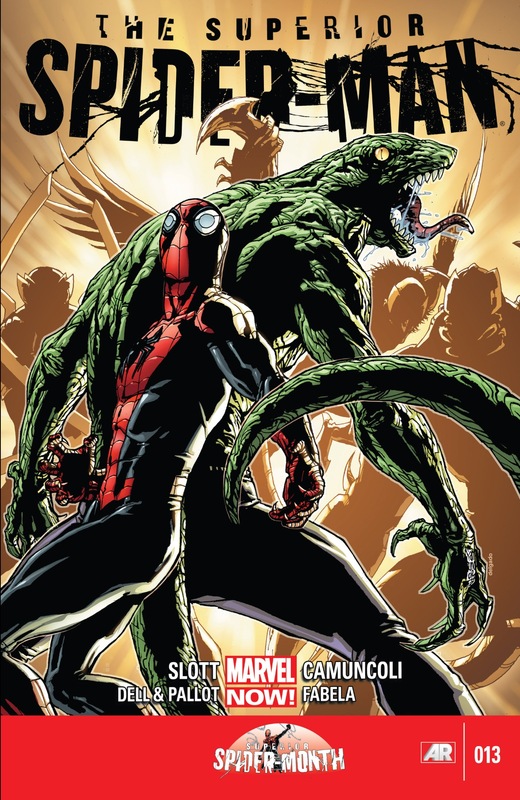 On the surface, Superior #13 shows Spider Ock making his most definitive separation from his superhero predecessor, Peter Parker, in the series’ short history. 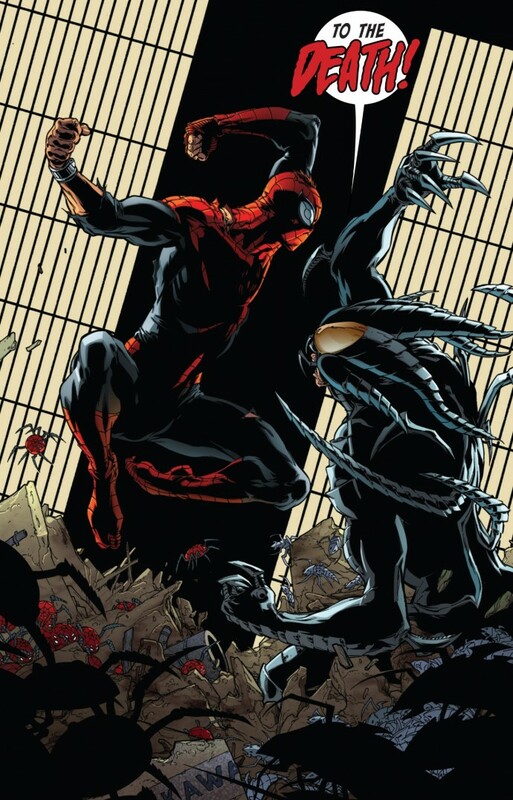 The comic’s ending – one that (as others noted) did come across as a bit rushed and sudden given Slott/Gage had three issues to build to this moment – marks the next major turning point in the life of the Superior Spider-Man series. And unlike in Age of Ultron #10 (more on that tomorrow), this turning point was both surprising and interesting: after blackmailing J. Jonah Jameson with his totalitarian desires to kill Smythe by any means necessary in Superior #12, Otto has taken over the Raft supervillain prison complex, where he will stage all of his Spider-Man business going forward. In a move that I’m sure was designed to needle some of Slott’s harshest critics, the new Raft complex will be dubbed “Spider Island II,” after writer’s most sprawling (and my personal favorite) arc on Amazing Spider-Man. As a concept and in its early execution, Spider Island II is about as far of a cry from Peter Parker’s Spider-Man as you can get – or as Marvel senior editor Stephen Wacker so trollishly eloquently put it on the letters page at the end of Superior #13, “your mom and dad’s Peter Parker” (let me also add for Wacker if he’s reading this that the Cardinals have always been, and remain pond scum. Let’s Go Mets). Your mom and dad’s Spider-Man was never this calculating and meticulous to warrant his very own complex to carry out his superhero activities. And he certainly wouldn’t be calling in minions, or assistants or whatever he’s doing (I’m assuming it’s the guys from the cover of Superior #14 that look awfully like the goons from the famed “Master Planner” arc in Amazing Spider-Man). And yet … here, I am chuckling again … Just as all faith is being lost. Just as I’m finding myself fretting about the direction of this series – does Marvel really think a comic book starring a former supervillain who still acts like a supervillain despite the fact that he’s masquerading as a hero have a permanent shelf-life? – I think long and hard and find Slott’s zag. Don’t get me wrong, I have no doubt that the Superior/Spider Ock era will continue as long as it needs to, and that Slott has a definitive beginning, middle and end to this saga in his head, that he will carry out to fruition without caving to pressure from angry fans and other malcontents. But the Superior Spider-Man story also remains, and I’m wagering a hefty sum, continues to remain, a referendum and what it is to be Spider-Man, i.e., just because Otto stole Peter’s identity and wears a Spider-Man costume, it doesn’t mean he’s actually Spider-Man (with a capital S). The true Spider-Man is Peter Parker, and the Superior Spider-Man comic continues to reaffirm this idea, despite any declarations of “Peter is dead, Ock is here forever” from the likes of Slott and Wacker. Why am I so confident about all this? Because the more egomaniacal Spider Ock gets, the more I believe the groundwork is being set for a major comeuppance for Mr. Octavius. He’s still riding high off the thrill of his “great reward” in defeating Peter at the end of last year (and then again in Superior #9). But the further Otto strays from the core of mom and dad’s Peter Parker, the closer I feel we’re getting to the inevitable return of mom and dad’s Peter Parker. As smart as Spider Ock appears in Superior #13 – and he certainly had ALL the answers for Smythe during their final confrontation, this issue is littered with empty promises and misguided threats, similar to what I talked about in Superior #10, which is going to make Otto’s hubris-fueled downfall oh so wonderful to watch. One of the biggest “a ha” moments for me came after Smythe regenerates for one last chance to “slay” Spider-Man. 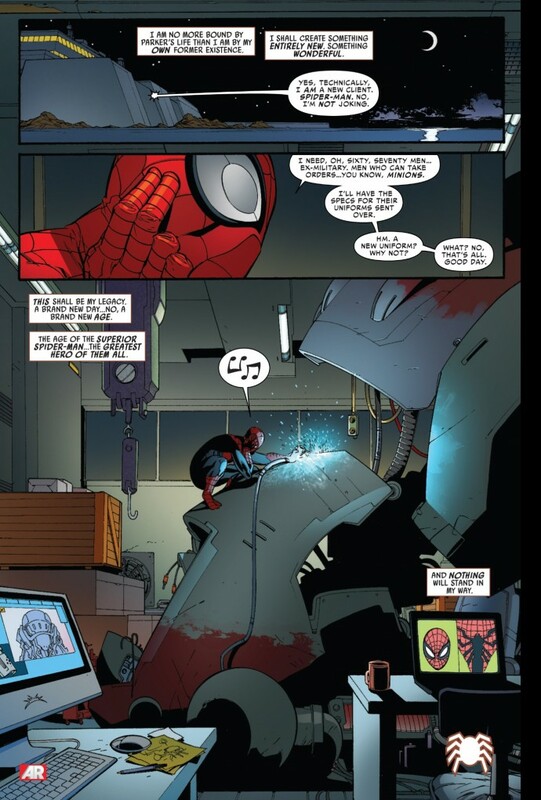 Upon delivering the final knockout blow, Spider Ock openly admits to Smythe that he hasn’t been dealing with the old Spider-Man, but rather Otto Octavius. Think about that for just one second. When has Peter ever been so carelessly flippant about his identity? I’ve been reading comic books long enough to know that a hero or villain can never assume the final defeat of his adversary. Ever. Norman Osborn has come back. Human Torch has come back. They always come back (except for Uncle Ben and Bucky). And even if Smythe NEVER comes back, Otto has already demonstrated that he’s capable – in a moment of true arrogance – of spilling the beans. Who’s to say the next time Spider Ock tells a defeated adversary that he’s actually Otto Octavius that the conversation won’t be captured by a Spider-bot or a news camera? Or that one of Spidey’s villains (or even another hero), doesn’t just rise up, punch Otto in the mouth and reveal his secret to the world? Maybe the admission was just designed to be a throwaway scene, but for the entirety of his run, Slott has just been so deliberate about these kinds of things. When reading ASM #600, how were we supposed to know that helmet Peter put on his head to control the octobots would come back to haunt him? Slott is not only a master of general Spider-Man continuity, but he knows his own continuity better than almost anyone. There are occasional moments of carelessness, or things being dropped, but the Otto/Smythe exchange felt too significant for me to brush aside. Then, of course, is Spider Ock’s back-stabbing of Jameson in Superior #13. As one of my readers aptly noticed in Superior #12, Otto records Jameson’s order to kill Smythe in order to blackmail him at a later date. One would think that with this recording, Spider Ock officially holds all the power in the Spidey/JJJ dynamic going forward. And I would think you’re forgetting that of all the characters in the Spider-Man universe, there’s no bigger survivor than J. Jonah Jameson. In one fell swoop, Otto has undone all of the good will he’s earned from Jonah the past 12 issues. History has shown that JJJ will go to the ends of the earth to persecute Spider-Man the “public menace.” Otto’s innate supervillain-ish lust for power and control has earned him Jonah’s seething animosity again, when Doc Ock would have been better off for his own long-term vision and goal to keep the peace between the two. And while Peter would always heckle and bully JJJ around, when did he ever go as far as blackmailing him? Jonah will want, and do everything he can, to get his revenge. And this is why I chuckle. Because as much as Marvel wants to present a world where Spider Ock is so firmly entrenched, he gets his very own “month” celebrating his existence, I see a character’s whose world is already starting to crumble around him. Best of all, the character doesn’t even notice the pieces starting to get chipped out of the wall. And I chuckle because of that too. I particularly like how he stands over Smythe’s body and comments on his legacy being, “Nothing.” He is doing exactly what Peter did to him to a guy who couldn’t pull off the same trick that he managed. Ock’s comeuppance is on the horizon but his complete and total lack of self-awareness is in full display right now. I’m unsure about the status quo shift at the end of this issue. It seemed to me like Otto has descended into Dr Evil syndrome and I am quite perplexed at where Spidey is now going with spider island 2. Then again as you have quite rightly pointed out Slott does employ a vast amount of twists and turns in this book I honestly thought ghost pete was there to stay longer than he did and was quite upset when he was removed. How long do you really think it will take for Otto to fall? I love this book it is my favourite comic I get every month (over my favourite superhero iron man) and I think half the fun is just waiting for that moment he falls. Otto based on these 13 issues cannot keep this up forever.